The food service program offers many healthy breakfast and lunch options for our students and staff. Our cafes offer a daily homemade selections and food bars full of fresh vegetables, salads and fruits. Click here or on the Apple Link to access our online menus. 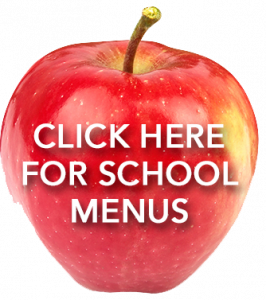 The links below will take you to additional menus, forms, and help you access information you need if your student has food allergies. If your child has a food allergy, please notify your school and the Food Service Department. Parents will be asked to fill out a diet restriction form and return that to the Food Service Department. Keep in mind a doctor’s signature is required on this form. Information is available to be reviewed in our office containing the ingredients we use in our menu items. Please contact Susan Livingston at 323-5155 if you would like to set up an appointment to review this information. Did you know? If you qualify for reduced priced meals you only pay $ .30 for breakfast and $ .40 per lunch! That’s a savings of $535 at the elementary level and $640 at the middle and high school level over the course of the school year! If you qualify for free meal benefits, you won’t pay anything at all! Students who participate in the Free and Reduced Meal Program provide extra state and federal funding for reading and math programs in their buildings. Free and Reduced Meal Benefit Applications can be filled out anytime during the school year. Applications are also available in your school office.